SWEET!! !> makes one want to have 10 arm/hand appendages on ones body. >> Nice. Hey, I can relate to that picture, though one appears to be quite oversize, (fiddle on steroids?) and one is missing quite a bit of its body (anorexic fiddle?)….. Now you need to hang them up on the wall with flimsy hooks and thin cotton string, like "someone" else seems to have done with his collection…..
All that I have to do now is to learn to play them anywhere near 'half' well. Nice looking set of instruments! Big Momma came out looking really excellent with the inlays. Do you feel it changed her sound much? I have a neighbor lady with the same passion for cats. Does your house smell funny? hers does, lol. 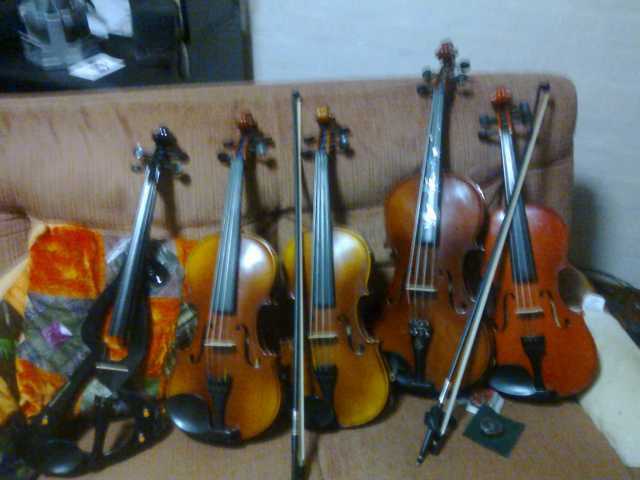 I guess a collection of fiddles is better! very interesting picture! 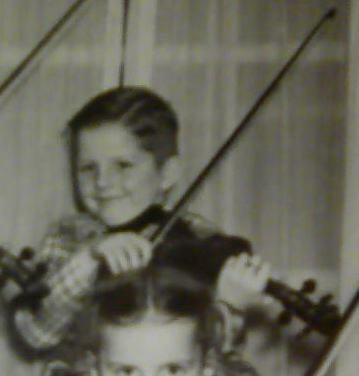 The electric violin is a sojing right? Spot on, it's a Sojing. In my opinion, as it arrives, it's a piece of garbage. However, to be fair, I should put a decent set of strings on it and try it again. Maybe I'm being a bit harsh. But I doubt it. Is it just me or do they all look like they're smiling at us? As someone with a crappy electric,i can relate...however now that i have a new acoustic,i feel like i love them both the same.You just can't choose between your babies,can you...no matter how different they are...you can't ever let go of them. So you just keep hoarding and make a big happy family! Sojings, at least a few years ago, were popular candidates for "silk purse projects". As in "making a silk purse out of a sow's ear". It wasn't so much because they were so bad as because they were so inexpensive compared to other electrics out at the time. If you look around the net, you can probably still find some of the projects folks did to upgrade them. But you want a good laugh, Ferret.. So far as I can tell, my electric is a knock off of a Sojing. No brand name and the shape is a lot like a Sojing and it cost even a little less. Hope you can get a chuckle off that thought, since I always have. But with a little work, the setup isn't bad, it holds tune, and I'd still take it over electrics I've gotten to try that friends own or that I got to try in local shops. And it's put up with a year of me pounding on it so far without anything breaking. Question: What's the difference in sound with a E-violin other than string's and the type of pick-up's used. I mean, what make's a $5k Eviolin better than a $ 125.00 E violin. There is no sound post, the hollowness of the body doesn't resonate, so what the difference? Very good question. There's probably not a $4.+k difference. Other than obvious things like quality of materials used and workmanship, and possibly the circuitry, I can't think of much that would make an electric violin worth thousands. But then, I'm an unimaginative sort, who can't understand why anyone would pay more than maybe 100$ for a stick with part of a horse's tail on it or how a violin could possibly be worth more than maybe at most $1k to a player. Antique or historical value, I can see. But for a new one? Sure, a $6,000 luthier made violin should be better than say a 60$ Mendini. But 100 times better? Really? Would a 1.5 million dollar antique actually sound or play 10,000 times better than my 150$ Hoffmann? I kind of have trouble believing that. With an electric, I can see where exotic materials, flawless craftsmanship and well designed circuitry could make it worth maybe 400 or 500. Maybe. Now you're thinking! I kind of like the wild body shape of the Sojing types. That sort of warped treble clef shape appeals to my sense of cool. But if you have a nice looking bit of wood lying around, it could be seriously fun to make a body for it that is more to your liking. I think I'll go for the extra points as well.